How tape recorders were invented. In my previous essays on Sound Recording, I looked at how sound waves were discovered and how mechanisms for recording them were invented. Next, we looked at the development of the electric microphone; and in the previous essay I described the development of the record player. Today we're going to look at the development of the tape recorder (including its closest relatives, the 8-track player and the cassette recorder). But I disagree that there is some mysterious force that makes Isaac Newton and Gottfried Wilhelm Leibniz develop calculus at the same time, or Armageddon and Deep Impact to be filmed and released the same year. Rather, I see that all discoveries (and movie plots) build on all that has gone before them. Once the groundwork has been laid and disseminated, a discovery will be inevitable, and several brilliant minds might well come to the same conclusions at the same time. So we have magnetic induction, the one single discovery most responsible for the later invention of tape recording, being discovered in 1831 by Michael Faraday, and in 1931 by one Joseph Henry in 1932. You've probably heard of Faraday; that you probably haven't heard of Henry just goes to show you that no one remembers who came in second place. I'm sure you've heard the word, "electro-magnestism". The word came about in 1873 with the publication of James Clerk Maxwell's A Treatise on Electricity and Magnetism, in which electrical interactions of positive and negative charges and magnestism were shown to be the result of the same force. However, that was over 40 years after Faraday's discovery. So what did Faraday do? Th early 1800s were filled with experiments involving electricity (following Ben Franklin's discovery, in 1746, that lightning and electricity were connected). Both the existence of electricity, in its static, shock-me-if-I-shuffle-on-the-wool-carpet, variety, and magnetism, had been known for centuries; but other than for compasses and chidren's toys, little use had been found for either. 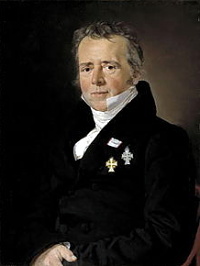 In 1820, a Danish chemist and physicist Hans Christian Ørsted was teaching a class in which he was demonstrating how the electricity from a battery could be switched on and off, when he noticed that, when the current was on, a compass that happened to be on his desk would shift from magnetic North. 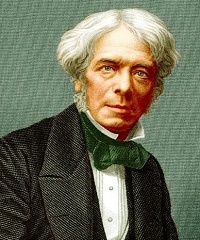 Faraday was trying to invent an electric motor, and word of Ørsted's discovery reached him in 1821. So he wound copper wire (known to conduct electricty, as copper was used as a material for lightning rods—something else Ben Franklin invented) around a spool and rotated it rapidly. As he'd hoped, a small electric current was produced. And…so was a magnetic field! But the big breakthrough came when Faraday assembled two insulated coils of wire around an iron ring, and discovered that passing a current through one coil would induce a momentary current in the other. He then found that a magnet moving through a loop of wire would create an electric current in that wire! The current also flowed if the loop was moved over a stationary magnet. This showed that a changing magnetic field produces an electric field, which, in its mathematical model is known as Faraday's law. Electric motors and electrical generators were the result. (In the one, electricity produces magnetism that turns the motor; in the other, rotating magnets (set to motion by water or wind) generate electricty. It was 70 more years before it occurred to anyone to use magnetic induction as a means to record and playback sound. 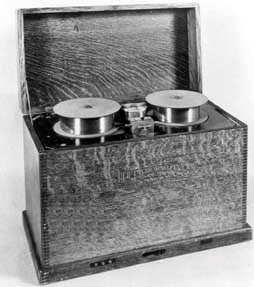 It was another Dane, Valdemar Poulsen, who invented the first wire recorder, called the Telegraphone, in 1898. The "wire" in question was a long length of steel wire on a spool, which was made to pass rapidly next to an electromagnet whose polarity switched rapidly in direct response to the current passing through a telephone microphone. The magnet would magnetize the steel wire; and when the wire was passed along the coils of the unpowered electromagnet, the magnetism in the wire would induce a current in the coils that could then power the telephone speaker. The Telegraphone wasn't very good; its only useful purpose was as dictaphone. And even that was a niche market already served by Edison's wax, re-recordable cylinders. Really, the only way the Telegraphone outshown the cylinders was that a larger spool could hold more wire, thus increasing the recording time. But the bottom line was, reproduction really sucked. The Telegraphone could not be used for music or, indeed, any consumer purposes. Sill, the premise was sound. Wire recorders of an enhanced design, that used electric microphones and speakers (or headphones) did become a fixture at the secretarial school for dictation between the 1920s and 1940s. Reproduction was still awful, but good enough for speech that had to be interpreted by one secretary and then typed, never to be heard again. One of the wire recorder's downfalls was that the wire could, and often did, twist so that its orientation to the magnetic recording/playback head was not the same for playback as it had been for recording, which could cause dropouts in the sound. Various schemes were tried for keeping the wire in a fixed orientation, but none worked. What was needed was tape, that is, a flat magnetic surface with a long length that could be stored on a reel analogous to the way the wire was stored on a spool. The problem was that tape, unlike the steel recording wire, didn't already exist. Not that tapes hadn't been tried outside of the magnetic recording realm. In 1886 no less a personage than Alexander Graham Bell made a long strip of paper, coated in beeswax and paraffin, that could be recorded on by a needle in the same way as Edison's cylinders. And in 1932, after the advent of sound motion pictures, Merle Duston, a Detroit radio engineer, created a tape recorder that used a low-cost chemically treated paper tape that recorded sound optically, the same as in talkies. Unlike film, though, the paper was self-devloping, so that a recording could be instantly played back via the photoelectric playback head. 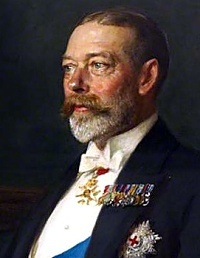 King-Emperor George V's opening speech at the opening of the India Round Table Conference on November 12, 1930. The First World War saw the manufacturer of reels of steel tape for various purposes, not the least of which was measuring for the creation of foxholes. 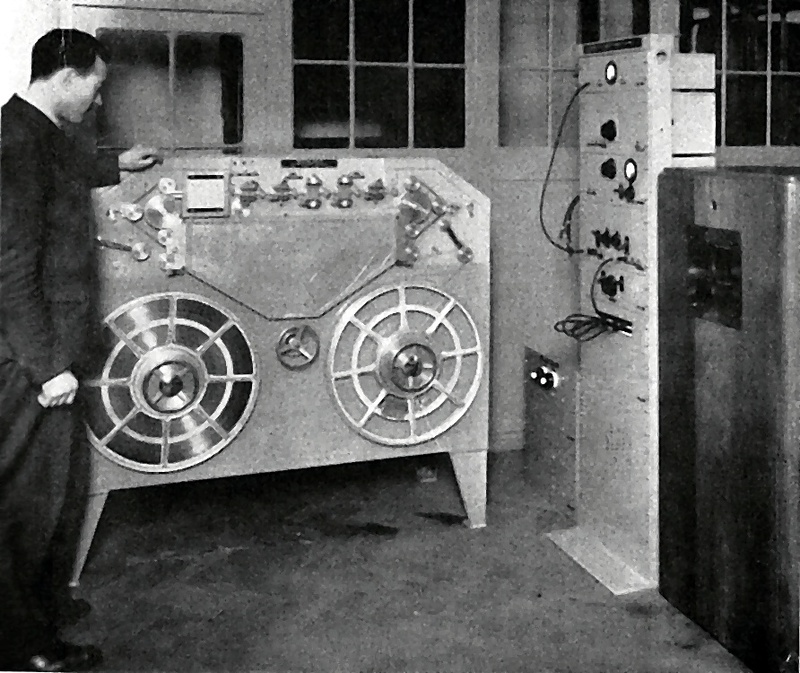 A German engineer, Louis Blattner, working in Britain, licensed a Poulsen wire recorder and started work on a machine which would record on a steel tape instead. He called this new invention the Blattnerphone, one of which was installed in the BBC in 1930, where it was used to record King-Emperor George V's opening speech at the opening of the India Round Table Conference on November 12 of that year. The tape itself was only 6mm wide, or about a quarter inch (near the width of cassette tape years later), which did not provide much surface upon which to be recorded. (The less surface area, we now know, the poorer the recording, all else being equal.) The scary part, though, is that the tape whizzed by at 5 feet per second. This gave a recording time of 20 minutes, but also provided some degree of danger as the fast-moving, narrow tape sped by like automated razor wire. And if the tape ran out to the end, it would flap like a sword, ready and able to rip anyone or anything that came too close, to shreds. Nevertheless, the Blattnerphone remained in use at the BBC into the 1960s, when the Beatles recorded some of their pieces for broadcast. (They even talked the BBC into allowing them to overdub—something that could only be accomplished with two Blattnerphones, playing one back while adding the live recording to a second. And, obviously, even in 1930s dollars, hiring orchestras for an entire day, day after day, was expensive. Accountants got damp just thinking about how much they could save their companies if only records—or some other medium—could be made to sound as good as a live performance! Since the Blattnerphone, for all its limitations, worked the same basic way as modern tape recorders, let's review how they work. The tape is coated with an iron oxide. (Later, other magnetic materials were used such as chromium dioxide, but the principle remains the same.) The tape is made to pass beneath a strong electromagnet with a narrow gap between poles. That electromagnet, powered by the electricity coming from an amplified microphone, reverses polarity in lockstep with the sound waves. Meanwhile, in Germany, Hitler's well-documented rise to power (by the same sort of ignorant bigots who voted for Trump some 80 years later) was paralleled by intense technological breakthroughs later used in the Second World War. One Fritz Pfleumer got a patent for a paper tape coated with iron oxide particles, something he invented specifically to overcome the difficiencies of steel wire and steel tape. Eight years later, the Magnetophon was demonstrated…but in Germany where it was invented; and, by that time, Germany was already keeping such technological cards close to its chest. Besides, the first iteration of the magneticophon tended to shred the tape with its needle-like magnetic recording head. A huge improvement was replacing the paper backing with one made of polyvinyl chloride (yes, the same PVC the pipes in your house are probably made of). This permitted the iron oxide to penetrate to a slightly deeper layer, meaning more of it passed by the (no-longer-needle-shaped) recording head for improved fidelity. In addition, it had been discovered that adding a high-frequency AC (alternating current) "bias" to the normal sound-frequency magnetic patterns, produced a much higher-quality recording. But by then the war was on, and technological secrets were closely kept in Germany (since Hitler was better at keeping state secrets than, say, Trump). So it was a mystery to the Allies when they noticed that identical broadcasts were going out from different time zones at different times. Logic said they had to be recordings; but they sounded like live broadcasts. The Allies assumed at first that the Axis must be using transcription disks, which were custom-recorded onto 16-inch platters made of a special low-noise material. But not even a transcription disk could provide the sound quality that was being broadcast; plus, the length of the broadcasts exceeded that accommodated by even the largest disk. Near the war's end, Allies captured some of the tricked-out magnetophons. 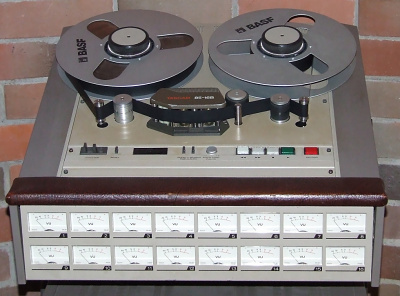 Reverse engineering gave us all the features of the modern analog tape recorder. And, after the war, with plastics rising to fill every available manufacturing niche, new magnetic tapes were manufactured with a thin plastic base. This brought costs of tape down to where high-end consumers could buy it. The improved oxide layers also allowed recording speeds to slow down to 15 inches per second (of tape passing by the recording head) from the original 5 feet per second, which in turn allowed reel size, and therefore motor costs, to be reduced with no loss in sound quality. Later, speeds could be reduced to 7.5" per second, and then, with less quality but still acceptible to most home users, 3.25" per second, with even slower speeds used for some applications, such as "books on tape". The rule of thumb was: Higher speed for higher sound quality but less time; slower speed for more time at a cost in quality. In other words, as with most things, hurrying comes with a reduction in quality. The TASCAM 85 16B analog tape recorder could record 16 tracks of audio on 1-inch tape. 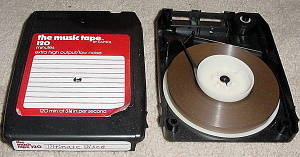 Professional analog units of 24 tracks on 2-inch tape were common, with specialty tape heads providing 16 tracks, or or even 8 on the same tape width for greater fidelity. The original tape recorders were all monaural, of course: One channel carried all the sound. So, no matter how good the recording and playback were, no listener could close their eyes and imagine he or she was standing amidst the orchestra. We have two ears, and each of those ears picks up a slightly different sound which the brain combines to create directionality. Obviously, two channels would provide an improved listening experience. By the time stereo recording became practical in the late 1950s, recording tape had improved to the point that the entire width of the standard one-quarter-inch tape was no longer needed for adequate sound quality (called in that era, "high fidelity"). Add this to the fact that recording in just one direction meant spending a few minutes rewinding the tape when it had been played, and the next advance was obvious: Record on just half the tape, then turn it around to play the other half. But this advance did not provide stereo; it simply doubled the recording time of a reel of tape. The slight distance between the tracks was needed to reduce "crosstalk", where sound from one track bled a little into the other. So, when a format for stereo tape recording was considered, it was decided best to stagger the tracks, which, while still allowing the tape to be "turned over", was not compatible with monaural recordings. In the 1970s, looking for some way to induce the home music audience to re-buy all their music, the industry took advantage of more finely-tuned recording heads to put four tracks on tape at once. Obviously, a 4-channel recording could only be played in one direction. However, the same recording decks could then record and playback, not only 4-channel recordings, but mono and stereo tapes as well, by selecting which channels to utilize. By the late 1960s and early 1970s, wider tapes had been manufactured for professional use, allowing 8, 16, or even 24 tracks to be laid down. Usually not all the tracks were used at once; the multitude of tracks allowed each instrument to be recorded while listening to the previously recorded tracks. This also allowed for one person to sing with him or herself. This had been done by Patti Page, and Les Paul and Mary Ford, in the 1950s, by using two tape recorders, listening to one and combining its signal with a live one. By the 1970s, Karen Carpenter could sing with 15 previously recorded Karens; by the 1990s, Enya was layering 99 voices to achieve her unique and haunting sound. 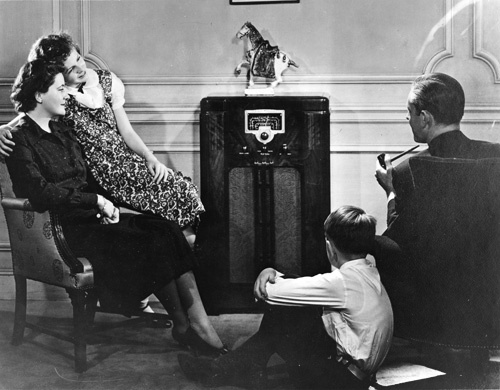 In radio, by the 1960s it was common practice to put commercials, which are recorded once but played often—for awhile—but then replaced with another. This made putting them on transcription disks a little expensive. 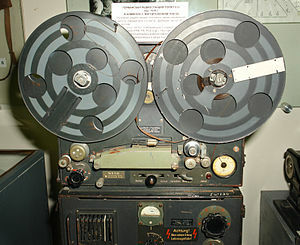 But reels of tape were bulky to manage in the crowded confines of a radio station studio. So 4-track tapes were used. However, the 4 tracks were not used to create four-channel sound, or even stereo. Instead, the amount of tape in the cartridge was kept to a minimum; and the tape was attached to itself to create an endless loop. On each pass, the playback machine would automatically shift to the next track, allowing for up to a 2-minute recording. Bill Lear, the man behind the Lear Jet, wanted to find a way to listen to one's private music collection while driving one's car. There had been an earlier attempt, called Highway Hi-Fi, that used actual records. This system worked as well as one might expect, especially on rough roads. But, starting with the basic premise of the 4-track cartridge and making a few tweaks, Lear's employee Richard Kraus doubled the amount of tracks so that stereo music could be played while still making just 4 passes of the lubricated tape loop. 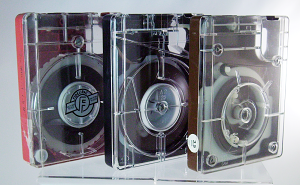 These were called "8-tracks" because the format specified 8 physical tracks on the tape. When they first came out, consumers could not buy 8-track recorders. (Eventually they were introduced but by then 8-tracks were already becoming yesterday's news.) I wasn't interested in re-buying all the albums I already owned on vinyl. The lubricated tape meant that the lubrication built up on moving parts within the cartridge, causing it, inevitably, to fail. Another, newer, and superior format had just been introduced, and somehow I knew that it would be a success. By summer of 1969, in my small city of St. Augustine, Florida, the prices of automobile cassette players, home cassette recorders, and cassettes themselves (both prerecorded and blank), had become reasonable enough that I could afford them on my lifeguard's salary. I was very proud of the fact that I had installed my own under-dash cassette player in my 1966 Valiant. The track layout on the tape made perfect sense, the first multi-track tape format to do so: The stereo tracks were laid down adjacent to each other, so a mono cassette recorder simply had a twice-as-wide head, providing complete backward-and-forward compatibility. The two narrower playback heads on a stereo device both played the same monoraural track; playing a stereo cassette on a mono player automatically mixed the two channels down to one, simply by straddling both which physically averaged their signals. Before I purchased any of it, though, I studied the specs carefully. My friends were so certain I was making a serious mistake by not buying 8-tracks like they had. But I loved everything I saw. Prerecorded cassettes were generally less expensive than the same album on vinyl. And the availability of cassette recorders, both portable (usually mono) and home units (usually stereo) meant I would be able to leverage my extensive record collection. I could also make what were later called "mix tapes". Although Dolby B was introduced in 1968, it was at least five years before it would be found on the majority of cassette recorders. Now, admittedly, cassettes had a serious flaw at the beginning: tape hiss. Recording speed was a mere 1.875 inches per second, and at that slow speed, the result was hiss. Of course, vinyl was subject to tick sounds and pops and skips; no format of that era provided anything near perfect reproduction. However, as consumers abandoned 8-tracks and embraced cassettes, cassettes underwent an intense period of technological enhancements. The first big improvement was the addition to the electronics of Dolby B processing in 1968, which altered the frequency response during recording so that high frequencies were boosted. During playback the high frequncies were attenuated, which also lowered the volume of the tape hiss to the point where it couldn't be heard. 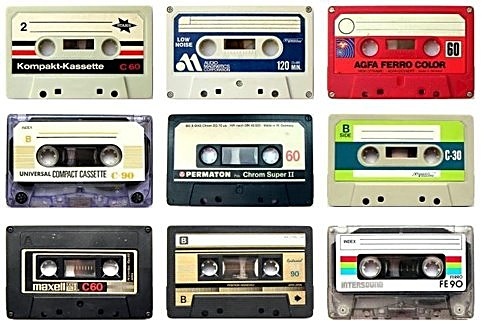 The introduction of Chromium Dioxide cassettes (first described in 1972) provided improved sound quality and less hiss; the combination of CrO2 and Dolby B (and a decent recording deck) produced cassettes with sound equal to or superior to vinyl for the first time. And that remained the state-of-the-art in recording for a decade, until compact discs were introduced.